The Lampivaara Café has been built from solid woods and is one of the first buildings to be erected in the Luosto area. Over the years it has become known to many wanderers and skiers as an energizing resting place where the friendly staff, delicious doughnuts and newly-baked buns and fresh coffee serve to make your break as enjoyable as possible. There is 5 km of lit track leading from Luosto to the café. In the café yard area, there is a sheltered fireplace where the visitor can freely light a fire. The café functions as a base station for the Amethyst Mine, and sells tickets to the mine. 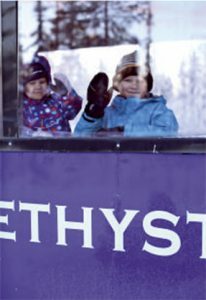 During the summer season (June – September) Lampivaara Café is open daily (October Tuesday-Saturday) from 10:30 am until the last tour of the Amethyst Mine (16:00 or 17:00, October 15:00). In winter time Café is open from December until late April. Place is famous among skiers and people hiking with snowshoes. It is always nice to enjoy hot berry juice with donuts in between your skiing trip. The café is open every day from 10:30am to 3pm.